President Armen Sarkissian has signed a decree to appoint Andranik Hovhannisyan as Armenia’s United Nations permanent representative in Geneva. Hovhannisyan previously served as an aide to the Armenian Foreign Minister. 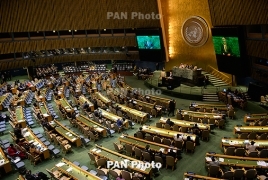 Armenia’s permanent UN representative in New York is Mher Margaryan.